Climbing Grade Karabiners made by DMM - for a quick release set-up of your Hammock. These ultra light, high strength Karabiners also act as a drip stop! 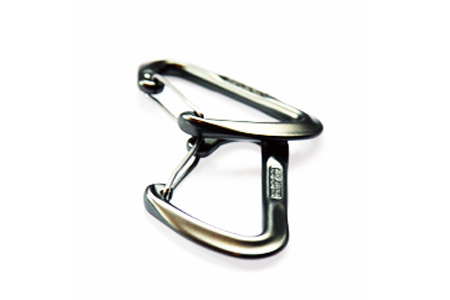 These ultra light, high strength, climbing grade karabiners made by DMM (a well known, high quality UK karabiner company) are a really useful addition to the hammock set-up. By attaching one to the webbing at either end of your hammock, they act as drip lines, preventing water running down the webbing onto the hammock in heavy rain. They also allow you to quickly unclip / clip up your hammmock if space is needed under your tarp during the day etc. And make it quicker to set-up / pack up your hammock. Please take care when trying this set-up for the first time, and ensure any knots you have tied are secure. The price shown is for two karabiners. You won't find these high strength karabiners cheaper anywhere else.